Before we begin, I strongly recommend you to read the first tutorial in this series, named “Creating a female cartoon avatar in Inkscape”. Many steps of this tutorial are the same that in the previous one, so I’m going to omit them. They are: setting the interface, creating paths, choice of colors, adding volume etc. All these can be found here. 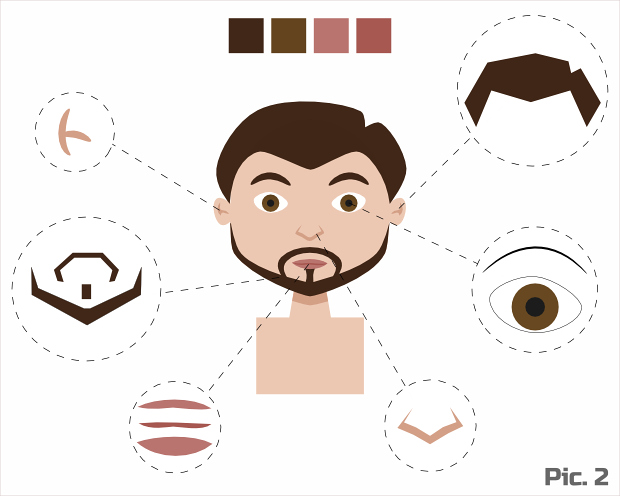 Create the basic elements of the character: the head, ears, neck, the shadow under the head and shoulders. It should be noted that in this case the head looks almost square and shoulders are sharper. with the Bezier curve (Shift+F6) in “Ellipse” shape mode. If the width of the path does not suit you, you should convert the object to path (Path > Object to Path) and go to the menu Path > Dynamic Offset (Ctrl+J). By dragging the white pointer to the left and right, you change the offset distance. To be able to edit and move the path after the applying Dynamic Offset, you should convert the object to path again (Shift+Ctrl+C). 2. Detail the ears, create the nose path and move on to the lips. After creating three objects for lips make the middle path darker to visually separate the lips apart. 3. Then move on to the creation of a beard with a Bezier curve (Shift+F6) and a rectangle (F4). Most likely, the beard will come out beyond the path of the head. If it wasn’t originally intended, unite both created objects (Path > Union) and do the intersection with duplicate of a head (Path > Intersection). By the way, the use of intersections can greatly simplify your work. 4. Create a hair path, make the nodes smooth. It should be noted here that the hair are placed in the foreground (Object > Raise To Top). 1. Clothing, in which our character is dressed symbolize his occupation. 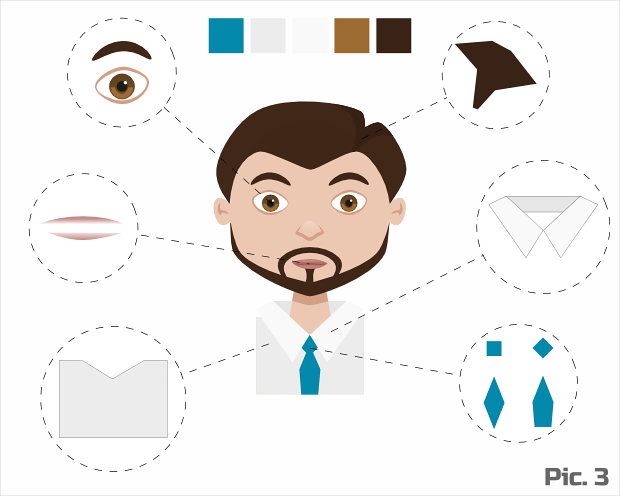 In this case, we have chosen the most common variant: a shirt and a tie. This look can tell that our character is the office employee. — Create a shirt path and move on to the shirt collar. The collar consists of three parts, one of which will be located behind the character (Object > Lower to Bottom). The other two parts are symmetrical, flipped horizontally (H) and filled with a lighter color. — The tie can be created by using a simple square (Ctrl+F4). 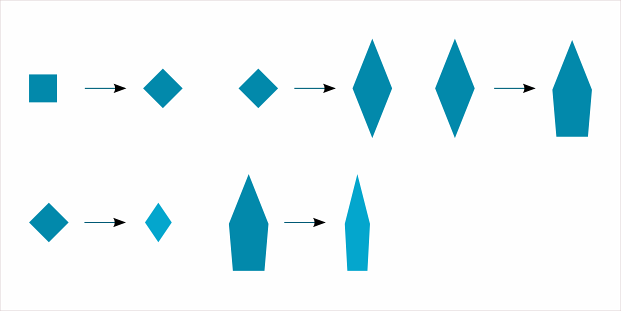 Duplicate (Ctrl+D) the rhomb, extend its length and add an additional node. Duplicate the shirt rectangle and make the intersection with the tie (Path > Intersection). 2. Add details to hair, eyes and lips. Finishing touches include creating shadows under the shirt’s collar, adding highlight on the nose, detailing hair and eyes, adding a volume to the tie with lighter elements. 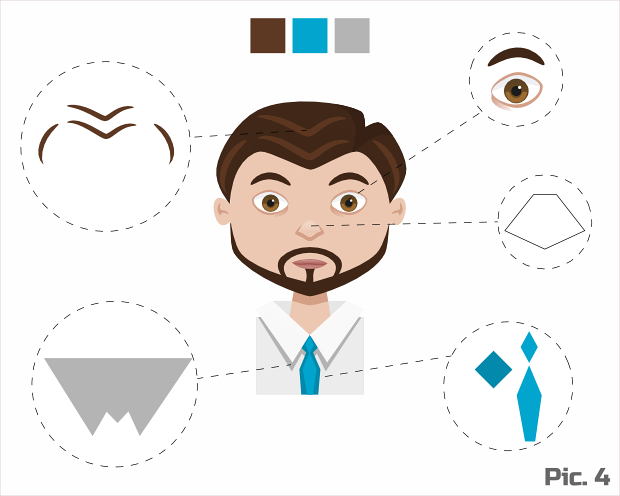 Some elements that make your avatar too much detailed (highlight for iris, lips and nose) may be omited. Especially if you plan to use avatar only in low resolution. That's all! 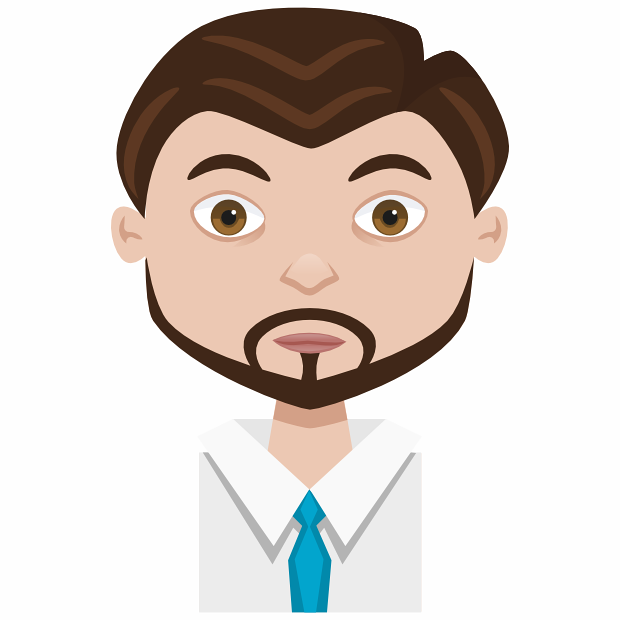 Our male cartoon avatar is ready. To make it more lively, you can experiment with its facial expressions. Such emotion as a surprise can be expressed through rounded mouth, wide eyes and raised eyebrows. Joy is expressed through a broad smile and happiness — with a bigger smile and raised eyebrows. Sneaky expression can be created with narrowed eyes, one raised eyebrow and with a smirk instead of a smile. When you create a facial expression you need to consider the position and shape of such face parts as eyebrows, eyes and mouth. You can even experiment in front of the mirror and try to portray different emotions by yourself as a reference. Totally cool. 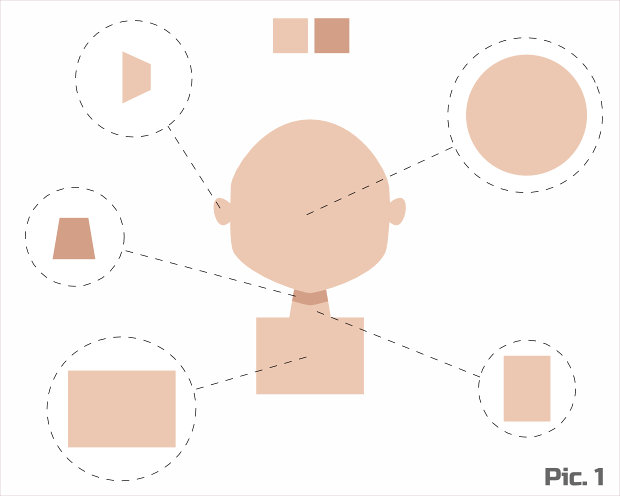 I actually wanted a collection of kids and young people for a Learning product logo. You have inspired me to give it a shot. It's going to be a fun Inkscape Sunday! That's great! I'm glad that it's useful. Absolutely stellar! Thanks for your hard work and effort to bring this to the Inkscape community. Very nice job, I'm try to illustrate a children's book with Inkscape and this post and the one about female avatar gives me very good ideas about how to design the characters. Thank you. Glad to hear that tutorials helped you. Thanks for the feedback and good luck with your project! Wow, this is such a great art work. I just started with Inkscape about a month ago and I had no idea how to use it but thanks to people like you I stayed focus and I learned a lot about the program. It is so awesome. Your Avatar looks sooo real. Thanks for sharing.